I've been working on squares for my latest blanket, and having a lot of fun with the process. 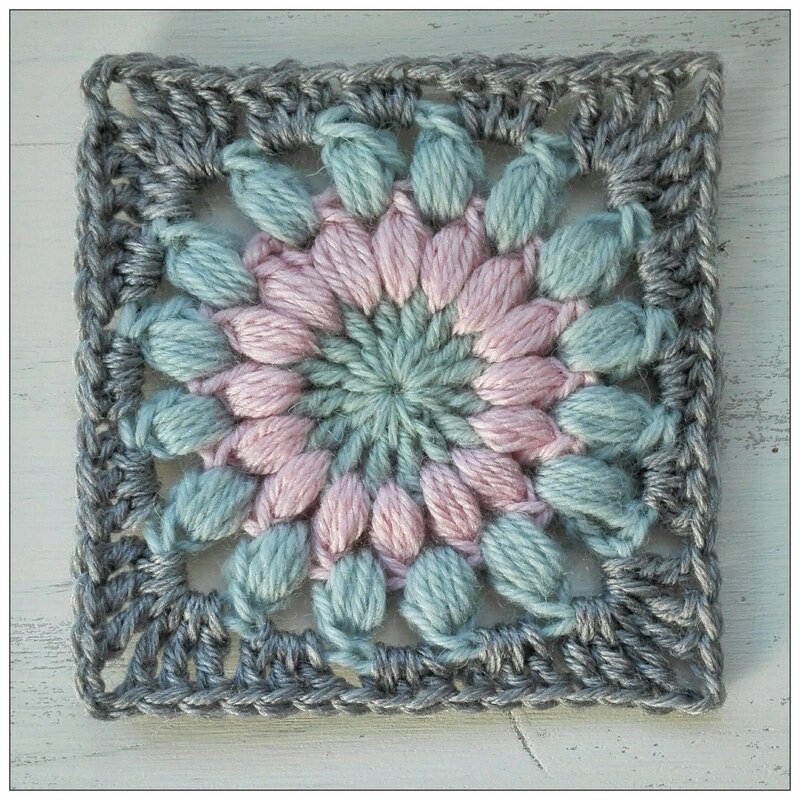 I've made a lot of circles and soon the time will come to add the last round of stitches and turn them into squares. As happy as that thought makes me, I'll miss having all these circles around, so I decided to turn a couple of them into a pincushion. I really needed one to store all my yarn needles as I am forever losing them down the couch, so it was the perfect opportunity to fulfil several needs! The spaces between the puffs are great for jamming a thick needle in! 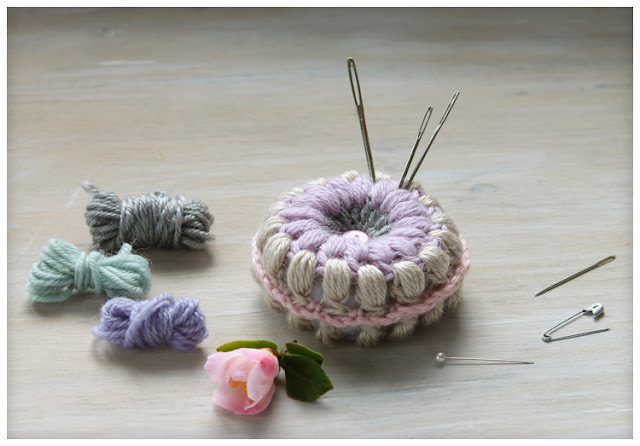 You can also attach safety pins or stitch markers around each puff. You could use this as a scissor keep, although I find those a bit bulky, so I just made a loop for it so I can pin it to the side of the couch when I need to keep it handy. Working a puff stitch: yo, insert hook into space and pull yarn through (3 loops on the hook), repeat 3 times (9 loops on the hook). Keep your tension quite loose as you are doing this - the loops should not be wrapped tightly around the hook. Yo again, then carefully draw the hook through 8 loops (2 loops on hook). Yo and draw the hook through the last 2 loops. Round 1: Ch 4, make 15 treble crochet stitches into a magic ring. Round 2: Ch 2, make 16 puff stitches, working into the space between each tr, with 1 ch between each puff. Round 3: Repeat Round 2. Fasten off. Make two circles, then hold them wrong sides together. 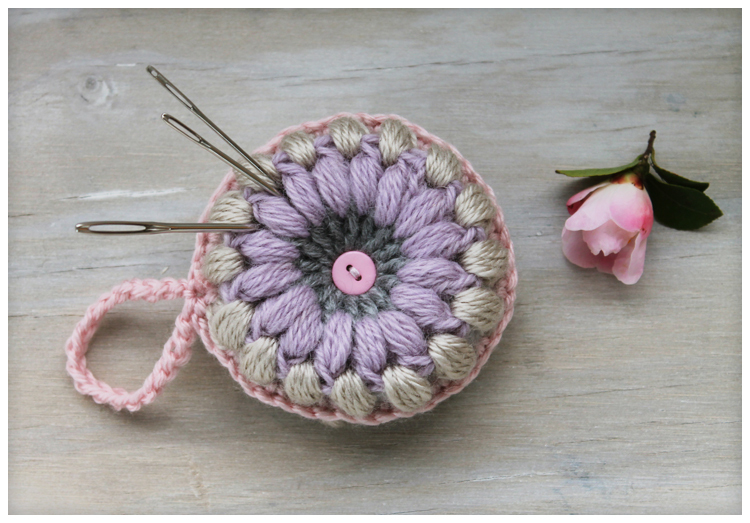 Work all stitches into both circles to join them. With a contrasting yarn, attach with a slip stitch into one of the ch 1 spaces. Ch 1, 1 sc into same space, ch2, 1 sc into space between puffs, repeat until 3/4 of the circles are joined. 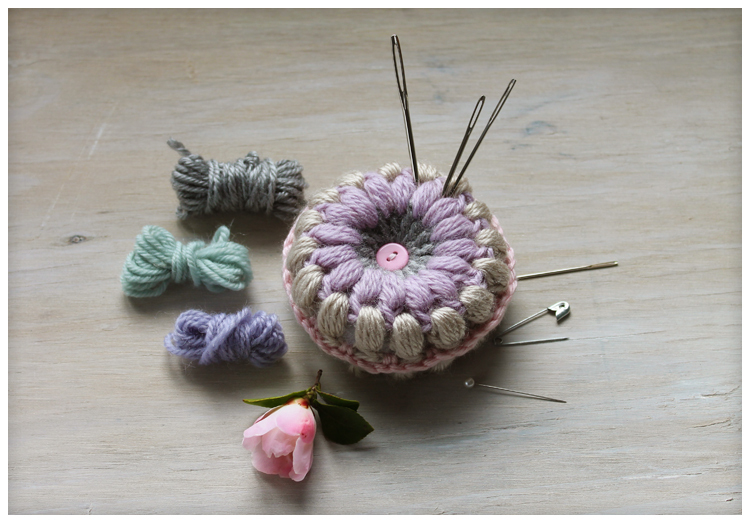 Stuff the pincushion, then finish joining. Before fastening off, ch 20 to make a loop for hanging. Join the end of the loop and fasten off. 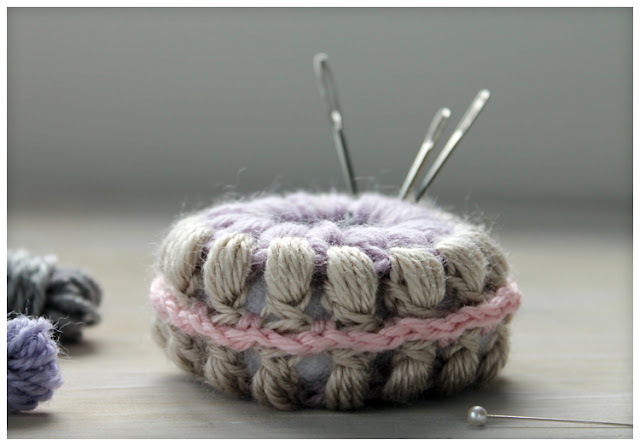 Take 2 small buttons and sew them one on each side of the pincushion, drawing the thread tight between the buttons. Fasten off thread.